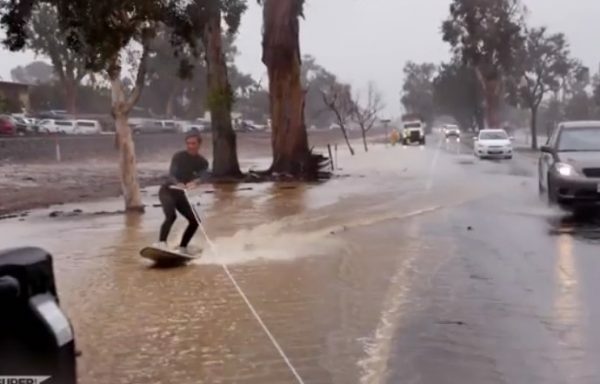 Earlier this week we brought you the story of a jet skier who took to the flooded Southern California streets. Well he wasn’t the only one taking things to extremes during the recent heavy rainfall. This clip from two young men on Highway 101 in Encinitas take street boarding to a new level. Watch below as Superbrand rider Grayson Amthor takes the skags off his surf board and gets toed behind Justin Coates in a pickup truck. They stick to the shoulder where the water is a few inches deep, just enough for Amthor to plane on the surface and shred. But look out, as potholes and branches still come into play. The two posted about their stunt on Instagram, saying the Fling board was a little beat up afterward but it was all worth it. An epic ride, that’s for sure.